Billions of bacterial cells are present within our guts, providing us with thousand times more genes than the human genome. This collective set of genes, also known as the gut microbiome, is increasingly acknowledged as a second genome and was built up following million years of coevolution between microbes and their host. It is involved in a wide range of biological functions, from the digestive, physiological to the behavioral. Changes in the composition of the gut microbiome can thus have important consequences for health. Recent changes in lifestyle, such as those introduced after the transition from hunting-gathering to farming some 10,000 years ago or more recently, during and after the Industrial Revolution, have introduced marked changes in the human gut microbiome. In a new article released in Scientific Reports, researchers now demonstrate that recent human activities have also likely impacted on the gut microbiome of animals. 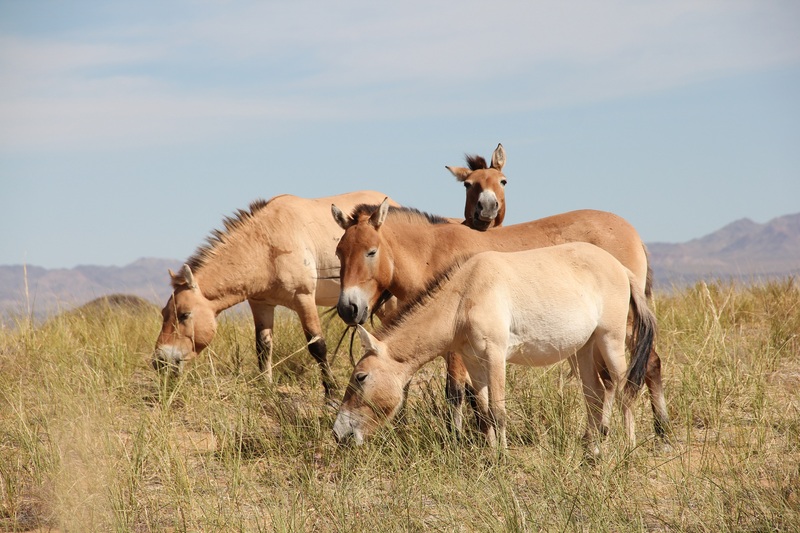 The authors focused on horses, where animals that have never been successfully domesticated – the Przewalski’s horses, either born captive in zoos or in reintroduction reserves – can be compared to domesticates. Their methodology was based on the deep-sequencing of DNA barcodes selected to identify both the bacterial species that form the gut microbiome, as well as the plants that are part of the animal diet. 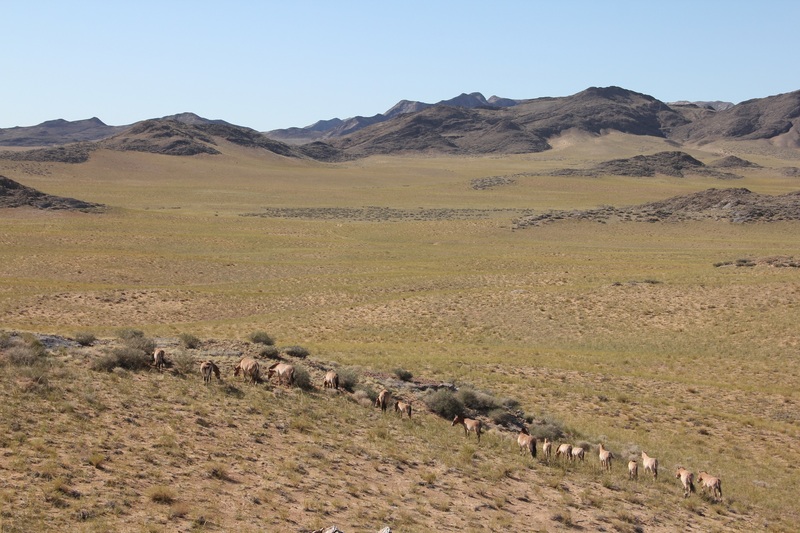 Przewalski’s horses, Seer reintroduction reserve, Mongolia. Copyright : Ludovic Orlando. “For DNA tests to be robust, we had to collect fresh feces in the field and maintain these at cold temperatures up until the analyses would be performed in the laboratory. This was quite challenging considering that Przewalski’s horses are endangered wild animals, and that the closest city was about an 8-hour drive from the reintroduction reserve. That would have been impossible without the fantastic team of local rangers from the TAKH association, which has been supporting the conservation of Przewalski’s horses for almost 30 years.” said Professor Ludovic Orlando, senior author of the study, Professor of Molecular Archaeology at the University of Copenhagen, Denmark, and CNRS Research Director at the University Paul Sabatier, Toulouse, France. “First, it opens for the possibility that domestication has not only changed the genomes of the animals, but has also impacted the composition of their microbiome. If true, breeding programmes will have to pay attention to microbiomes if aimed at preserving the whole functional potential of extant breeds. This has potentially massive consequences for the agricultural industry.” said Doctor Jessica Metcalf, leading authors of the study, and Assistant Professor from the Colorado State University, Fort Collins, USA. “Second, now that we know that captivity also affects the long-term composition of gut microbiomes, we need to consider the potential consequences on the animal chances of survival once reintroduced in the wild. Gut microbiomes might thus be an important factor in the success of reintroduction programmes…” concluded Professor Orlando. This work resulted from a collaboration between the Knight’s laboratory (University California San Diego), the Taberlet’s laboratory (University of Grenoble, France), Valerie McKenzie (University of Colorado Boulder) and the Orlando’s laboratory. It leveraged on the methodology developed by the Earth Microbiome Project (EMP), and was mainly funded through the John Templeton Foundation, the Keck Foundation (EMP) and the ERC Consolidator PEGASUS project (Ref. 681605).